Mansfield Town boss Adam Murray was delighted with an away point in today’s 1-1 draw at high-flying Luton Town and said his players were disappointed not to take all three. Murray also promised Stags would soon get the rub of the green at home and end up ‘smashing someone’. Stags led through Matt Green’s early strike only to see Luton earn a point with a 77th minute equaliser. “Obviously we are happy with a point away at one of the biggest clubs in the league,” said Murray. “We fulfilled the game plan, but with that extra five per cent, that last decision, that last pass, the quality of the last pass, we felt we could have took all three points. “We knew with the quality of players they had we were going to have to defend at times and were going to have to control the game without the ball, and I thought we dealt with that superbly. “It was probably just that cutting edge in the last 20 minutes where, because we didn’t execute that final pass, we had to defend a little bit more than we wanted to. “There is an air of disappointment in the changing room as we felt, especially first half, we were the batter team. They had a lot of possession, which we knew they’d have. “But we were in control, we never felt threatened. We felt when we won it back we were going to create an opportunity. “In that first half we could have probably done a little better with a couple of the half-chances we created. “But we knew as the game wore on, if we were in a leading position, they were going to throw the kitchen sink at us – they made two subs and had five up front at one time. 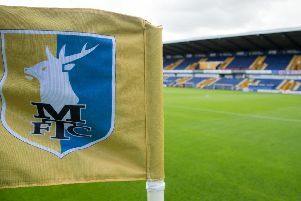 Stags have still to get a run of success going at home and the manager added: “The old adage in football is if you pick points up on the road, win or draw, and you win the majority of your home games, you get promoted – that’s the rule of thumb. “It’s marginal things at the minute. At home we are trying everything, we just need that rub of the green.